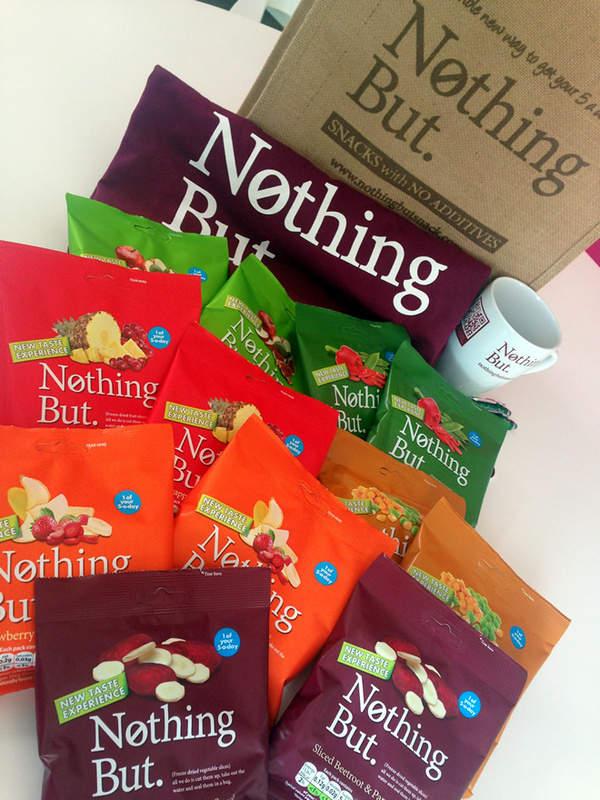 Nothing But is a range of freeze-dried fruit and vegetable snacks. They are an excellent alternative to the more traditional baked or fried snacks with each packet of Nothing But providing you with the equivalent of 80 grams of fresh vegetables or fruit. Basically each pack contains just the vegetables or fruits in their freeze-dried form and that is why they have been called Nothing But. The packs look similar to packets of crisps and the snacks have a crunchy texture like crisps. But that is where the similarity ends. With no added fat, sugar, salt, colour or preservatives these snacks are gluten-free, low calorie and suitable for vegetarians and vegans. So, how do these snacks fare in terms of taste? Mr.H loved the fruity versions while surprisingly I enjoyed the vegetable packs. The snacks have a lovely crunch to them and are perfect for those times when you fancy a healthy nibble. All the snacks have beautiful, vibrant colours and look very inviting. The taste of the fruit/vegetable comes across very strongly mainly because no additives have been added. So, if you like beetroot, then you will like its freeze-dried version as well. My favourite was the pea and sweetcorn pack which was very lovely. The Mange Tout and Red Pepper version was again very colourful and while I liked the freeze-dried red pepper the same cannot be said of the mange tout. This could be probably due to the fact that mange tout is not a vegetable I enjoy. Mr.H liked all the fruit versions with the Pineapple and Grape snack being his favourite - naturally sweet and with a lovely texture. This one and the other fruit versions would be an excellent choice to go with your morning cereal. Entry is via the Gleam widget below. Please complete the mandatory options and as many of the optional entries as you wish. All the best! I would like a mixture - one of every flavour. I'd love a fruit multipack! I would love to see a mixture of both. I would like an all fruit option. I love all the different berries mixed together! I'd really love a mixture of both fruit and veggies! id like to see a mix of both, particular flavour combinations would be carrot and beetroot, and strawberry and mango. Probably separate, but I love the beetroot and parsnip ones. My all time fav! I would like a mixture of both! All the berries in one. I'd like to see a vegetable selection, maybe a root veg variety pack. in addition it would be nice to have pea without sweetcorn. I love peas but hate sweetcorn! All veg for me - I'm a massive fan of vegetable crisps! I think two different multipacks would be best. One with veg and one with fruit. I'd like to see an all fruit multi-pack, with raspberry, strawberry and pineapple. I like mixing sweet and savoury so something like beetroot and apple would be lovely. I'd like a mixture - no preference, would love to try them all! I'd love an all veg multipack as something a bit different :) I love the sound of these! I would love a mixture of both fruit and vegetables and some blackcurrants too. I'd personally like a mixed multipack, but I think perhaps it would be better to have an all fruit pack and an all veg pack. I think I would like to see a sweet and sour pairing like beetroot and lime. I'd like to see an all vegetable multi pack with maybe sweet potato used as a flavour. My mother loves these! It would have to be a mixed selection for us! A mix of both would be great. I love these. My grandchildren have them for healthy snacks as well. I would like Pineapple and Coconut.